I was recently assigned to Tacloban to facilitate our training here, and last weekend, I decided to go back to Cebu. Yesterday was my flight back to Tacloban, and was scheduled at 1225. Upon arriving at the airport at 1100, I was informed by the airline representative that my flight was cancelled and was moved to 1830, boarding time would be at 1755. I was given one complimentary flight and was promised one free meal as compensation. I was fine with it since my training would start at 0630 the next day. That means, I will arrive at Tacloban at 1915 and would still have time to rest and prepare my things for the training next day. However, what happened was we left the Mactan-Cebu International Airport at 0005 of September 29, 2015, and arrived at Tacloban at 0035. Let me tell you about what happened and how totally unprofessional and incompetent Cebu Pacific Air is. Upon checking in, I was informed that my flight was cancelled and moved to a different schedule, which is 1830. I was given one complimentary flight and a free meal. They gave me my boarding pass, which says our boarding time would be at 1755. I patiently waited for the boarding time, playing Clash of Clans and Summoners War. By 1815, there was still no update about our flight, and it was already way beyond our scheduled boarding time. I approached the airline representatives at Boarding Gate 5 and asked them for updates; there, I was told that our flight has been further delayed to 2130. We were given another set of free meal and were told to wait for 2130 for our flight; 2130 came, and there was still no update. Had we not asked, we were never informed that our flight has been further delayed to 2245. Not even a simple announcement was made. We were made to keep waiting without any idea of what is to happen. The scheduled time of departure came, and once again, there was still no update. I personally talked to the manager, Liel Marie Joaquin, and asked her what is happening; she could not even give me a concrete answer. She told us that our final schedule would be at 23:45. At this moment, everyone was already mad. They decided to give another round of free meal and another complimentary flight. Since some of the passengers were not from either Cebu or Tacloban, they offered hotel accommodation or 500PHP transportation allowance as further compensation. We were boarded at 2355, and we took off at 0005. We were at the airport for almost 14 hours. Now why do I say that they are unprofessional and incompetent? Because of the things that they did not do: set proper expectations, display common courtesy, ensure convenience, and hold accountability. During check-in, I was given the new estimated time of departure, which is 1830 and boarding time is 1755. This never happened! Our flight had been “further delayed” several yesterday. How difficult was it for them to set proper expectations. They knew that there was no available aircraft that day to take us to Tacloban, why then did they give us a flight schedule? It was either they made sure that the schedule they gave would push through, or they tell us properly that there was no aircraft at that time to take us to our destination! Despite knowing that our flight has been further delayed several time, they did not make any announcement nor give any updates. Had we not approached them for updates, we would have never been told that our 1830 flight had been moved to 2130. Few hours passed and our new scheduled boarding time came, and still there was no update, no announcement made. I personally asked the personnel on their counter what was happening, and they told me that our flight has been further delayed to 2245. At that point, I was already ready to snap. I asked them how come they did not make any announcement. The only response they gave was that because they were waiting for their manager to give them a go signal to make the announcement. What an abomination! We were already beyond our boarding time, and there was no update—again! Every time the flight had been further delayed, they did not give any update. They all waited for us to ask before giving updates, and not even announcing it to the waiting public. A simple advance announcement would have sufficed; it is common courtesy to inform the waiting passengers (most of us had been there since 1000 and 1100). It was rude of them to keep us all waiting uninformed about the status of our flight. How difficult was it for them to announce the updates over their intercom? It was very exhausting waiting in vain. We waited there at the airport for several hours. Personally, I was there for almost 14 inconvenient hours. The boarding gate was filled with passengers from all the delayed flights. It turned out that all Cebu Pacific flights that day were all delayed or cancelled. There were no seats available for some of the passengers even. They all knew that most of their flights were delayed, what could they have done differently to ensure that their waiting passengers would be convenient? And what did we get? Three sets of cheap meals that did not even total to 200PHP. Is that the price of our inconvenience? One Chao Fan from Chowking and two sets of chicken fillet meal from McDonald’s? Around 2115, almost everyone was already impatient. I found out that some of us there had already been rescheduled from their original flight (September 27, 1225) since it was cancelled the day before as well. We requested to talk to Joaquin, the manager, to get clarifications. It took her more than 30 minutes to show up and explain everything. I talked to her personally to identify the root cause of the flight cancellation. She said it was due to aircraft situation. I pointed out that since they already knew the day before that the flight would be cancelled, how come they did not have any back-up plan to ensure we will not be inconvenienced; she did not answer. She said that this is already the back-up plan. To fly us to Tacloban as soon as they can. The thing is, the original back-up plan to fly us at 1830 failed; did they not have any other plan? All their back-up plans failed, multiple times! I asked her several times, and all she responded was, “wait lang jud, sir” (Just wait for moment, sir). They gave out copies of these documents, passing it as an acknowledgment receipt. 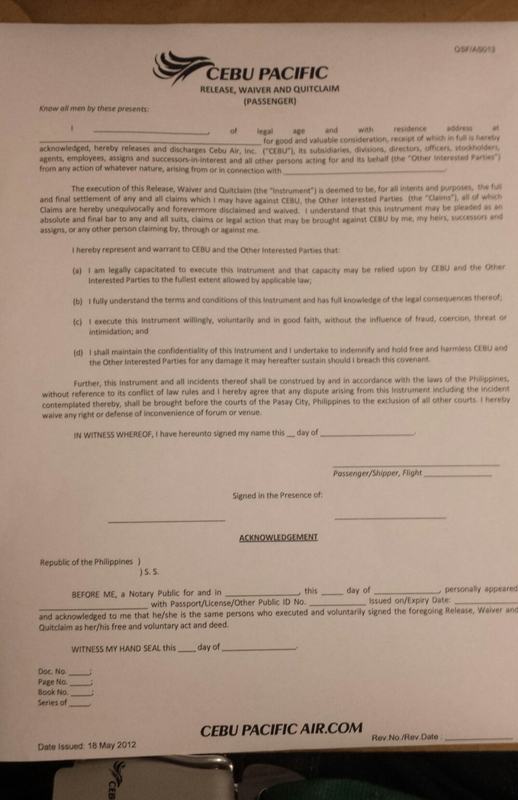 I was surprised when I read the form; it was actually a quitclaim—a document once signed by the passenger releases Cebu Pacific Air from any damages, liability, responsibility, and lawsuit in connection to what happened yesterday. I was appalled at how they manipulated their passengers to signing this document, making the passengers believe that it was an acknowledgement receipt. They paid their passengers 500PHP or an overnight hotel accommodation into unknowingly releasing them from any lawsuit or liability of their utmost incompetence! This is a new low! Something so unprofessional! Can they not hold themselves accountable to the consequences of their own incompetence? On top of that, those who asked to have hotel accommodation instead were told, “Lantawon ra nato, ma’am, sir, ha kung naa ba miy makuha na room para ninyo,” (We’ll see, ma’am, sir, if we can get a room for you). This was outrageous! They already knew the flight was cancelled and their so-called back-up flight was delayed, they should have already prepared the hotel rooms earlier. And what is worse? When we arrived in Tacloban, there were other passengers waiting to be boarded and taken to Cebu. They have been there since 1200 as well. We arrived in Tacloban past 0100, and those people were just as tired, impatient, and inconvenienced as us. I understand that aircraft situation (however vague this reason is) is out of their control; at the same time, there are a lot of things that they could have done differently to ensure that their passengers are well taken care of. I challenge Cebu Pacific Air to do something differently next time this happens, and if they want to respond to this post, they are free to do so. And again, I did not book a promo flight; I deserved better than this. Everyone in that flight deserved better than this! I also challenge Cebu Pacific Air to answer these questions: What could you have done differently? What would you do differently next time to prevent the same situation from happening? I signed that form twice already but never actually read the content. Woaahhh! It was too long for an acknowledgment receipt, so I read it. And it was not. This concern has been prevalent for years and little did I even know what the content of those documents they hand out is. Though never had I tried to be in your place mate. Anyhow, thanks for the raising this. No worries. More people should know about this. Last December, they had a lot of delayed and cancelled flights and they were made to pay their passengers thousands of pesos, and that is probably the reason why they make their passengers unknowingly sign this quitclaim. It is just appalling that they are misrepresenting it as an acknowledgment receipt.